Do you have any ear piercings? What do you think of my ideas? i really want my tragus!! Wish I had some ear piercings! Tragus piercing on the left and two cartilage piercings on the right sounds like THREE extra piercings not two! I like the piercings in the picture on the bottom left - very pretty. I'm desperate for my tragus but I'm scared of pain haha! Never going to work! Oh my, you're reading my mind, it's all I've been thinking about for the past few weeks! I really want to get some extra piercings on my ear, but I'm afraid that it'll hurt or that I'll regret it or (my hypochondriac side comes out) that it will get infected or something. But it just looks so lovely on everyone, I just really want one! I love tragus piercings! I think they look so fab, I'd really like mine done once I get my mothers permission (on the same list of tattoo - it may be some while). Cartilage piercings look good too though, such a hard decision! I don't have any ear piercings, but I do have my septum piercing! hehe. but i might get it again and get my tragus pierced too hehe! Love piercings! I have 5 and I'm getting 2 more in some days. I like a lot theideas, especially the 2nd one! 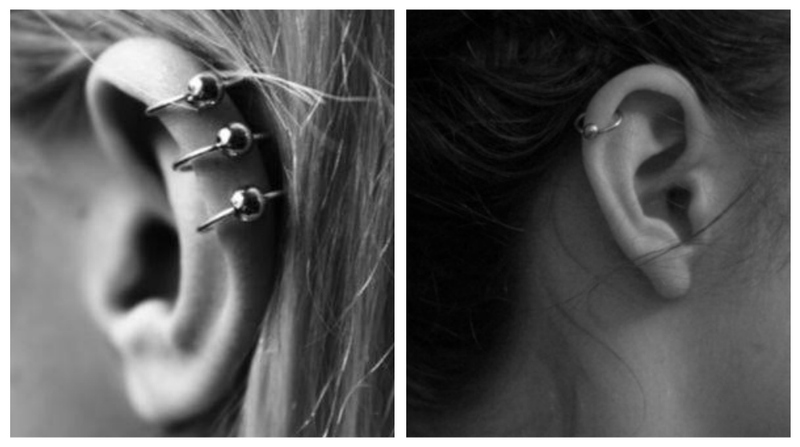 I love the first and third piercings! I am now following your blog! Thanks for visiting mine and for your lovely comment! I have quite a few ear piercings but my ears are pretty big so I think I get away with it. My right ear is heavily stretched then I have two cartilage piercings around the middle/top. My left ear has a scaffold bar and two lobe piercings. 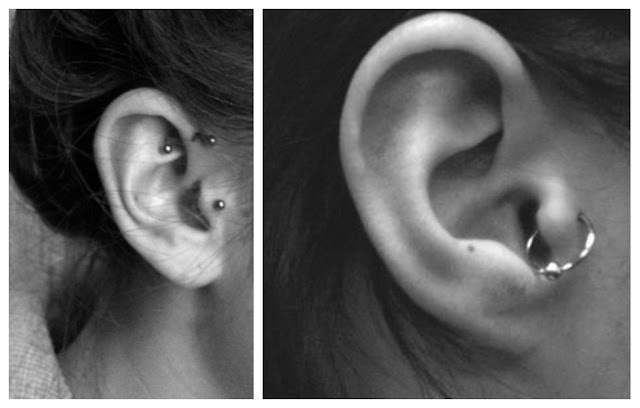 I'd love to get my tragus/anti-tragus/conch pierced somewhere along the line & I'd definitely say go for it. The best thing about having piercings is you can always take them out and let them heal if you change your mind or fancy something new! I'm your new follower by the way, great blog. beautiful !!! !amazing blog!!! !i'm following you!! !if you like mine,do the same!!! i'd love a cartilage piercing but i'm too scared, got my lobes and thats it! i'm sure it'd look great on you!